When you allow yourself to forgive, you create infinite growth within yourself. Holidays are never easy for anyone. Christmas, Thanksgiving, Valentine’s Day and of course Easter. Oftentimes, with holidays come stress, anger, and discontent where there should be love, joy and the rejoicing in family and friends joining together. When did we allow ourselves to replace these jubilant occasions with such indignation? As a whole, we have somehow become bitter and indifferent. What led us here? How long do we plan on living our lives dictated by the negative emotions that we often feel? Most importantly, how can we break the cycle? How do we break free from the chains that we have bound ourselves in? Life has taught me many valuable lessons, none of which have made such an impact or added value than the art of forgiveness. Many many years ago I was in a relationship, long term, and eventually we ended up getting married. Our lives were chaotic to say the very least. I married my high-school sweetheart hoping for the white picket fence fairy tale that most young women dream of. Growing up, we went through what I considered to be normal relationship issues; infidelity, drugs, lying, stealing.. why I considered this to be normal is another story for another day.. he was young, I was young. We continued and moved forward. Each time I was wronged I decided to “forgive” him. Time after time, he played me and I allowed him to play me the fool. Fast forward to 12 years later, close to our wedding day. We owned businesses together and he was often preoccupied with chasing leads and doing “business things, or so I thought. We were married, after a 12 year courtship, in Las Vegas in 2007. (This was not a spur of the moment typical Vegas wedding, our families were there, we had bachelor/bachelorette parties, the whole nine yards). In my heart of hearts I knew this was not a marriage destined for the 2.5 kids, golden retriever and white picket fence that I had envisioned, yet, I said “I do” on July 21, 2007. A short three months later, we separated. My life was turned upside down with revelation after revelation of adultery, deception and flat out heart wrenching reality. My husband was not who he presented to be. How had I not seen the depths of his deceit long before that fated day in July? The pure anger that I felt towards him was nothing short of impressive. I had always considered myself to be a calm and forgiving woman, look at our history, but this was an entirely different pain. This was complete and total defeat. I blamed him, I blamed myself and quite honestly, I had as much indignation towards myself as I did him. I allowed this to happen. I was just as much at fault. I knew that I would never be able to forgive him, let alone myself. As time passed, several things happened, we, obviously, were divorced and I moved forward with my life and he with his. It was not an amicable divorce, as he refused to sign the papers for a period of time. We had lawyers who went back and forth on bills and property, the business and even our dogs. I wanted only one thing. Out. In the end, I walked away with my dog and very little else. I had lost material possessions and even worse, my self respect, my sense of worth. Until August 18th 2008. That was the day, over a year after this mess had all began, we met one last time for mediation, to sign the final papers. The man that entered the room was not one that I recognized. He was beaten down emotionally, exhausted and he looked to be genuinely sorry. This was not the armor of a man ready for a fight. He was wearing the look of total defeat. During the mediation, he cried. He wept like I had never seen him cry in the 13 plus years I had known him. It was there in that badly furnished, dimly lit courtroom, in that last minute of eye contact I have had with him since, that I decided to forgive him. I took a deep breath and let every single ounce of hate and anger go. My thoughts of vengeance dissipated and I was able to see so much more clear. I felt as if I could finally let go. I had now seen him for who he truly was. I did not tell him that I forgave him that day. This was my moment of forgiveness and it had nothing to do with him. I did not, in fact, tell him until 5 years later. Five years had passed and I was living what I thought at the time to be my “best” life. I can clearly remember cooking dinner for myself and my current boyfriend, when my phone rang. It was an unrecognizable number but definitely a recognizable area code. I answer and on the other end of the phone was a voice I thought I would never hear again. We exchanged pleasantries for a few seconds before I finally asked “Why are you calling me?” His response was immediate and sincere. He was calling me to ask my forgiveness for every awful, life changing thing that I had endured because of him. He spent over an hour apologizing and explaining. I allowed him to talk, because I knew that this was something that he had to do for himself, not for me. When all was said, my response was equally immediate and sincere. I told him that I had forgiven him years ago. The relief and shock in his voice was something that I can still feel. When I explained to him that in order for me to move on, I had to forgive him. I had to release all of the power that his actions had held over me for so long. He thanked me, apologized again, and that is the last time that we have spoken. I tell this story because the power that giving and accepting forgiveness is something that can not be put into words. You become a different person without reservation, without chains binding you to the past. Shortly after letting him know that he had been forgiven without even seeking it, I was able to forgive myself. I now know that I am not who I was then. I was not responsible for any of his actions and I could not have changed them if I tried. I alone possessed the power to release all of the toxicity from our tumultuous relationship. That night, I released all of it, and I have not looked back since. 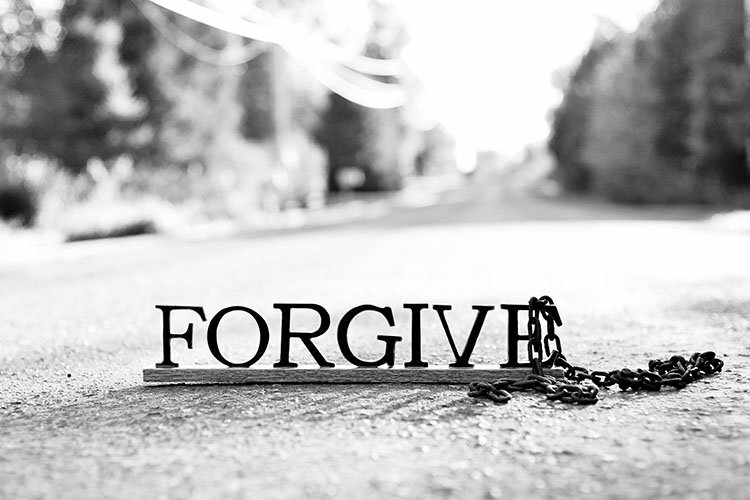 We would all live a much more peaceful existence , if we were all able to realize just what forgiveness can do. It is not easy. That in life, which is easy, is rarely worth it. So regardless of your belief system, which holidays bring your discontent, who has wronged you and where you are in your life, for one day reflect on the power of one action. The action that quite possibly could allow us, as a society, to live in a much more harmonious state. Consider forgiveness and the steps that you will take to get there. I can tell you from personal experience, the most powerful feeling is the ability to forgive someone unreservedly. Even when the person you are forgiving is not even asking for it and especially when the person that you are granting forgiveness to is yourself.